KSK Big Game Outfitters of Nebraska offers fantastic trophy elk, buffalo, turkey, Texas Dall ram and Fallow deer hunting opportunities. KSK Big Game Outfitters is owned, managed and operated by the Kreycik family. We have been in the hunting business since 1994 and growing steadily each year. We are a family-operated business and the ranch has been in the family for at least 5 generations. 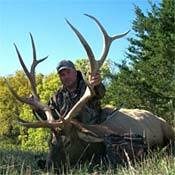 KSK offers trophy elk, buffalo, turkey, Texas Dall ram and Fallow deer hunting opportunities. Our hunting area, headquartered at Kreycik Riverview Elk Ranch, consists of densely covered hills and canyons along the Niobrara River Valley in northeastern Nebraska. The nearest airports are Sioux City, IA; Sioux Falls, SD and Omaha, NE. All meals and lodging are provided on all elk and trophy buffalo hunts. You will be eating delicious home-cooked meals with the Kreycik family in the ranch house. Our ranch lies along the Niobrara river. Our property has a little of everything from rolling hills and wooded parcels to scenic rivers and lakes, along with a ton of wildlife. The Missouri river flows to the north of our ranch with the border of South Dakota not far ahead. We have had a lot of tourists and hunters tell us that this is a very beautiful and scenic area. Some have even said that they like it better than going to the black hills in South Dakota. There is fantastic waterfowl, deer, turkey and pheasant hunting in the area as well. We have a nice pheasant shooting preserve 3 miles from us, so if you want you can hunt elk and buffalo and then go over and shoot pheasants during the same hunting trip. 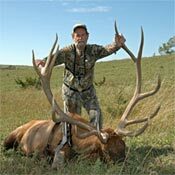 Here at KSK Elk we have been hunting elk for many years. We've been shooting about 25-plus bulls a year. We are always willing to work closely with our customers and answer any questions they may have. On the turkey side of things a report came out that our turkey population has increased 500% in the last 10 years and is still growing and doing well. We have hybrids, Rios and a few Merriam turkeys. We have a place that we can get you larger Merriam birds. We also have a connection on Osceola hunts where you can get a grand slam. Our turkey hunts have gotten great reviews. We've had many experienced turkey hunters from all over the United States claim to have never seen as many turkeys in one place as they have here. For more information on available dates and price quotes go to the KSK Big Game Outfitter's web site below. To book a hunt now call: 402-857-3850 or 402-394-7532 or E mail.